Do you have a passion for bridal fashion? Do you swoon over every wedding dress you see? Are you the type of person that gets excited just opening a wedding invitation in anticipation of the joy of being part of that special couple’s wedding day? If these statements sound like you, then you may be a perfect fit for The White Dress! Bridal Style Expert – We think that “Dress Consultant” sounds a tad boring. So we call ourselves Bridal Style Experts. The perfect candidate is someone who loves fashion, especially bridal fashion, has an eye for style, and who has a friendly and good-natured personality. He or she must be up for the challenge of working in an ever-changing environment and, most of all, must love to work with brides! Hiring both full and part time positions. 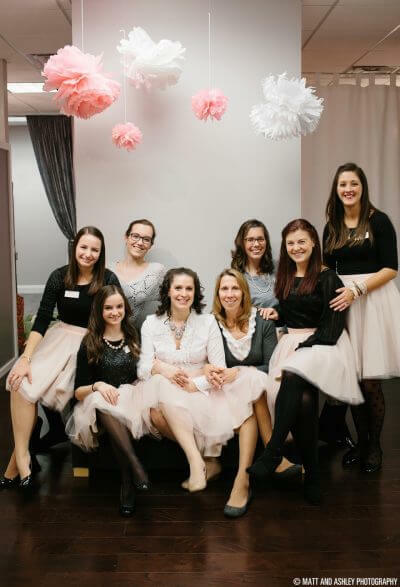 Shop Admin – Are you super organized, detail oriented and have a love of all things bridal? If so, then you may be a great candidate for a TWD Shop Admin. Individuals who are eager to help keep things organized behind the scenes at TWD are a good fit for this position. Steaming and Receiving Assistant and Manager – If you want to be a part of the action at our shop, but don’t necessarily want to be working one-on-one with our clients, this position could be a great fit. Individuals must love bridal, be super organized, and not mind hanging out in the TWD Steaming and Receiving room where the magic happens! Hiring for both full and part time positions. Tailor/Alterations – These individuals must have past experience in bridal alterations and should be prepared to show their work (hem, side seams, bustles, etc.) As this individual will be working very closely with TWD brides, he or she must also possess similar characteristics that define TWD’s Style Expert Team – friendly, hard-working, and a can-do attitude. If you are interested, please fill out the application below and submit it, along with your resume, to [email protected] or mail them to our shop at 209 W. Main Street, Suite 101, Brighton, MI, 48116. If we see a good match, we will be in touch!